My upcoming long term project is all about building a credential system. Most of the first reflexes on hearing is “Go Directly to Badges, Do Not Pass Go.” It’s two weeks before I start, but my brain is already in motion, so I am info grazing. Now I have been a little bit flip about mocking badges. So I plan to step back and learn more, especially as now the magic words are Badges + Blockchain. Fortunately we have a good information detector on the case. So here is a thing. Without surprise I am reading stuff from Doug Belshaw given his involvement past and present with Open Badges. In his most recent post Why do we hire based on ‘experience’? HR, Automattic, and Open Badges, Doug describes 3 ways “in which badges can be used to unlock those chunky black box qualifications” including Granularity, Evidence, and Portability. None of which I disagree with. The Evidence one has had me puzzled though. 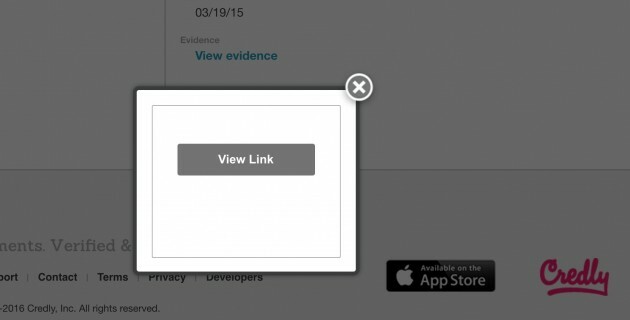 whereas LinkedIn profiles and CVs are a bunch of claims, Open Badges can include a bunch of evidence. Proof that someone has done something is just a click away. I’ve been looking at a few badges (am not quite finding a good place to locate them, I expect they are all inside of LinkedIn, where I lack an account. Please for the love of my sanity, I hope I do not have to activate my LinkedIn account) mostly when people have tweeted them or a few I have managed to spot in blog sidebars. I found someone who had some badges from University of Florida’s BlendKit (which I hear many good things about) (don’t get all and at me). 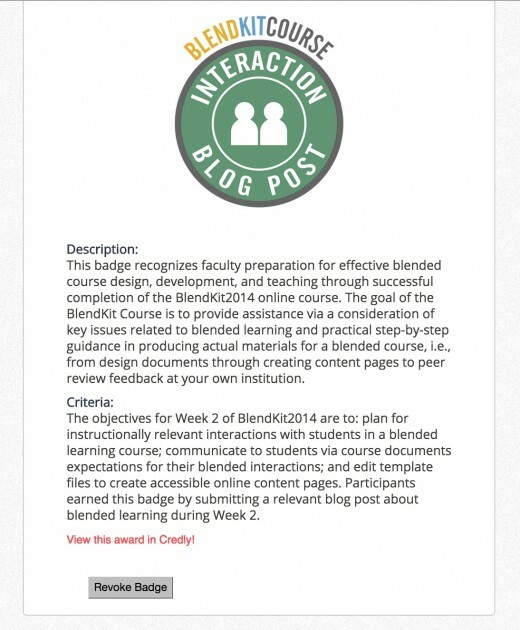 I might first have to put aside my questions about getting badged for writing a blog post? Really? This is the kind of microcredential that will help us have an attractive record? Should I apply now to get the 4850 blog badges I might deserve? I don’t need a badge to show I can write a blog post. I have a blog. 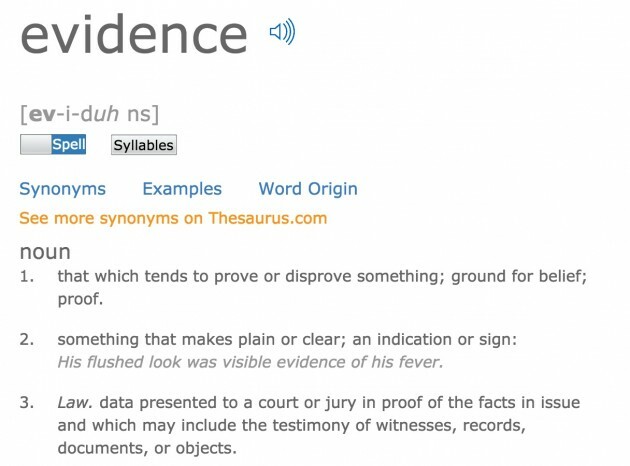 That is evidence. It’s tangible and visible. The Credly evidence is a statement that this person wrote a blog post. It is nicely formatted and has nice colors, but what if actually want to see real evidence of this person’s blog post for week 2? The evidence I got after two clicks?? It as a link to http://www.educause.edu/eli. How the bleep is this for Pat being a Thought Leader? Another one I saw for being a presenter, the evidence link was to a web page that had a conference program. Would not better evidence be a link to the presentation itself, or a video recording? Now I have only looked at a few badges. If you know of ones that have something more substantial for evidence, please share them. I am not seeing these links as being evidence of a skill someone can examine. These are merely links that provide evidence of a badge’s existence or nothing at all. And if badges are being built upon the system that we can trust blindly the authority granting it (which is important), that we will just take their word for it, it would like being admitted to Stanford solely on my official transcripts, or being hired just from my resume. To me certification without tangible, evidence of the skill/knowledge in use, in the world, is a lot of badges on an empty backpack. Is there more evidence of evidence? What am I missing? I am sounding like a badge critic, but that’s how I look at things, critically. It’s why I see badges as one part of certification, being badged is a passive act, even with blockchain secure authority, it is done to you. As important, is what you do yourself, in active tense, to demonstrate your own evidence. Get badged, yes, that’s one part of showing what you have done. But get out there, get a domain, and show the world what you can do. That is evidence. 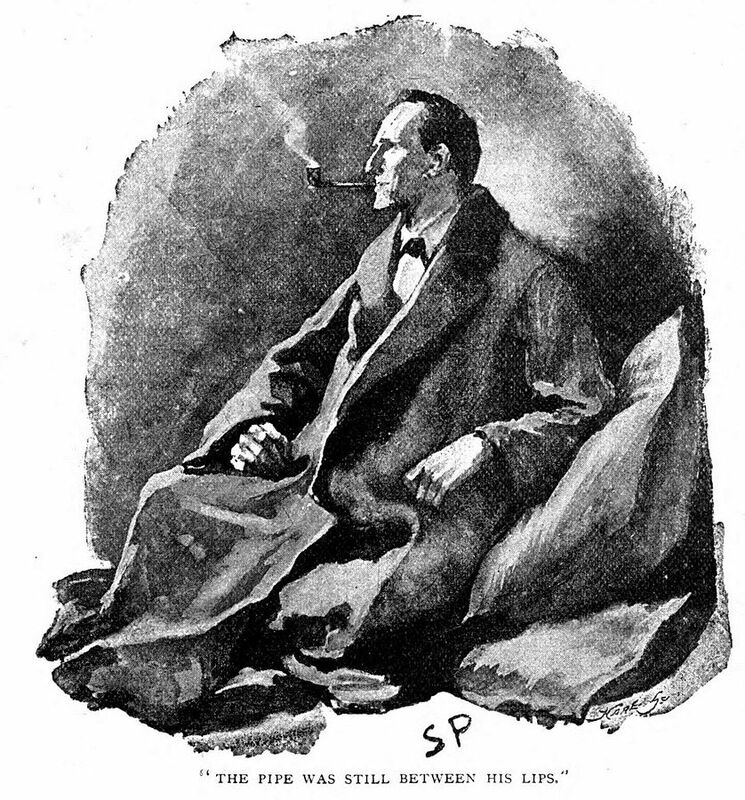 Top / Featured Image: Before I even hit the search, the metaphor for evidence I sought was Sherlock Holmes, who figured out everything from mere evidence (and logic) (and a pipe) (and talking to Watson). So the search in Google Images on “Sherlock Holmes Evidence” (with results limited to licensed for reuse), there were a number of options, the only problem was most were portrait orientation. Thanks fo this Alan, and great that you’re considering using Open Badg s to build a credentialing system. 1. Evidence is an *optional* metadata field in the Open Badges specification. There’ll be lots of badges without evidence, either because what’s being badged is low-stakes, or the mindset of the badge issuer is still badges = digital certificates. 2. People are likely to misunderstand what the evidence field is for. I’ve talked to plenty of clients who have put what should have been in ‘criteria’ in ‘evidence’ instead. Part of this, I think, is because we’re used to having credentials designed for us instead of building the, ourselves. Thanks Doug. Yes, I do get that a lot of badged stuff is pretty micro (which has me wonder about the value, that’s another thing). How granular is worth going? If we badge for doing a blog post, do we have a badge for using hyperlinks in a blog post? For embedding media in a blog post? Do a whole lot of tiny microbadges really add up to something? I have 4000 blog posts, what would I do with 10,000s of badges for everything I have done. Yes, I get there being a learning part on how to use the evidence field. But that EDUCAUSE one is just stupid. Everything has value in context, and we use data points to triangulate and make decisions. Some badges will be the digital equivalent of a certificate. Nothing wrong with that. Here’s the PhD certificate to put on your wall, and here’s the Open Badge to display online. I’m more interested in credentialing things that are usually *described* rather than *evidenced*. So for example, one of my clients, City & Guilds, have a qualification called TechBac which also has associated badges to demonstrate proficiency in workplace skills. To answer your point about ‘value’ this is something that’s addressed directly by the learner being in control of displaying their badges. Let’s say you *do* end up with 10,000 badges. You wouldn’t display all of these. Some of them might roll up into meta-level badges. That means you might show that one instead of the ten than led to it. and you’d show different badges in different contexts, just as you do if you were applying for several different jobs with a standard CV and covering letter. Finally, it’s worth saying that the value right now is in the low-hanging fruit, that is to say the notion of ‘microcredentialing’. Badges can capture a much more holistic picture of the learner. I’m definitely up for that, especially given the alternative is some predatory VC-backed edtech company allowing people to issue credentials in their shiny silo! I think all you’re missing is FERPA paranoia. Gods forbid we actually show you the student work. The small amount of badging play I’ve done has ZERO in the way of letting the person receiving the badge say what it points to. And when you dig into the credentialling bits in OpenBadges they point to one thing, generically written as you’ve seen, because apparently it’s difficult to dynamically point to the real evidence. In my opinion you’ve found the business opportunity here – but good luck unpacking it. I think it’s also the point where everyone else has given up. I have the FERPA bullet. The student publishes their own evidence to their own site- the whole point fo FERPA (I think) is that the decision and control for information is in the hands of the student. They choose how much information gets put online, take the organization out of the equation for providing evidence. I think we should all make badges for each other as a Daily Create. I can also make my own badge, which would be fun. You could dispense CATFISHING badges. Badge fun for everyone! I herewith declare that I Ronald am entitled to put the Ronald badge on my website. This has all to do with accreditation and trusting the party who hands out the badges. We’ve been able to buy non existing degrees by non existing academic institutions for decades. The problem has been there for quite some time and will probably be here for ever. Glad to hear you’re looking into this with a critical eye. As Amy Burvall says on Twitter, it’s easy to do badges poorly. Lots of examples of that out there, as you’re finding! I do have some somewhat higher stakes examples of others’ badges in the wild lying around somewhere. But not all of them will have evidence, other than where they’re embedded. I’ll see what I can quickly dig up for you. If LinkedIn requires a login, I’ll snapshot them for you. And, of course, ePortfolios can and do live on WordPress, either explicitly, or implicitly in blogs. The blog post I’m struggling with today picks up the thread about badges helping harden evidence into discrete (re-)usable modular chunks that can be remixed in ePortfolios and blogs. I hope to have it out tomorrow. “Completing the Credential at the Advanced level can lead to the Master of Professional Practice (Information Technology)”. If he gets enough of these, he can earn a Master degree by taking only one traditional course, at a fraction of the cost and time of getting a traditional Masters degree. DeakinDigital claim that their assessment criteria are more rigorous than most Masters programs. These badges sit with other evidence in the person’s LinkedIn profile. Maybe he doesn’t need a full Masters degree, maybe he just needs a few of these to make it onto the next rung of the ladder. My point here is that Open Badges don’t have to be “weak sauce” but they also don’t always have to contain evidence. Badges like these from a trusted institution (or connected spinoff) can be more usable proxy evidence than a full degree and, as you said, can be combined with other evidence to build a bigger picture. Thanks for the examples. I mean that. I have a sinking feeling that my work is going to force me to re-open my closed LinkedIn account (and I am trying to resist asking why Open Badges are in a LinkedIn Silo). Look I am not saying all badges need evidence, and I agree that there are things that maybe a stamp of certification is sufficient. But again, I remain firm that badges alone do not give a full picture of what someone can do. All I am saying is that I saw badges that claimed to have evidence that were weak. Agreed that it’s sad that LinkedIn has become the world’s de facto resume and will track our careers against our proofs of education and training (like Lynda.com, coursera and badges) as they build their business graph of the world with the object of selling this data from our free accounts to all comers. But the LinkedIn question always comes up in conversations about badges and social media. Credmos, Open Badge Academy, BadgeList, Digital Promise, PDLN, SSSC badges, and Open Badge Passport. I’m most familiar with the last one, which has free accounts for end users and was developed as a companion to Open Badge Factory – a more dependable alternative to Backpack. Users can create simple Pages combining badges with text curation links, files and embeds – effectively brochure portfolios. OBP also has a Gallery where people can share their badges, lots of which are higher quality re criteria and evidence, if you can read the Finnish, but there is a lot of UK content also. Plans are to develop this into more of a community space for individuals and organizations. I worry I may have carpet-commented this post yesterday, so I’ll try to subside now. It depends on how the badges are designed – we use them for pretty concrete things that have evidence – usually administrated by an actual human who grants a badge based on material provided by the person who wants the badge. Lots of interesting things (and some less-than-interesting ones that amount to digital attendance registries, but even those are used only as a gateway to the system, rather than as the end goal). First, let me say that I think you will be a good person to be making badges. Because you are doing Western 106, you know about Badges, which are for sheriffs and marshals, which are in the west. But more than that. Not just any person can have a badge. A badge is a special thing, because if every Buddy has the same badge, then it’s not special. Remember how when all the Sneeches wanted one upon thars, and then two and then nothing, it was all a fad. Maybe instead, badges Need be like when a knight had a shield with all of their personal stuff on it. Because then, everyone was different, just like people, and it wasn’t so much about who had the most things, but instead what were the important ones on yours, like your digital identity but on the shield. Plus, some of them should be animated GIFs, like some of the true friend web badges that I made for all my true friends! Those are just some starting thoughts that I had. You will have some more of your own. Maybe this is good material for your as-yet-officially-unannounced keynote at ePIC 2016 in October? We do like critical viewpoints at ePIC. Returning after Stephen’s post on OLDaily. It strikes me that he (and to a lesser extent, you) are negating the value of badges to novices, because from your experience as people with decades of online experience making and publishing stuff, you have no need for badges. Badges are useful for scaffolding novices – giving them a set of concrete steps to work through as the approach a subject or context. Would the perception of badges be different if the context was “learning conversational Swahili” vs. “build a digital presence”? I definitely agree with the formative value of digital badges, but if they’re just providing course scaffolding or campus orientation, why bother making them Open, i.e. portable? I think there’s room for both kinds: internal Digital and portable Open. Most systems allow for both kinds, which ties some people up in knots. For me, the summative, transferable value of Open Badges is what really makes them interesting and provides justification for blockchains, etc. I can see that. I am not negating anything. I am new to even thinking about badges, so I am asking questions. I see value in badging but the badgers seem to see no farther than badges. And, perhaps by now, y’all have seen this? If the problem we are trying to solve is “plain text transcripts are so obsolete!”, then any kind of badging is (probably) a step forward. Once we get into this for ePortfolio type reasons, I think this is all going to come up short. ePortfolios as simply collections of badges that may or may not link out to “evidence” misses the possibilities afforded by networked platforms. There’s no way of knowing if students are making connections between ideas, between people, between learning experiences. We can force learners to make those connections explicit when their evidence lives on a web-based platform that allows for tagging, categorizing, etc. So, I second Alan’s call to “…get out there, get a domain, and show the world what you can do. That is evidence” and offer the friendly amendment to ask learners to show us the connections. Connected learning, FTW! I wonder if badges could compliment the DS106 Assignment bank or the like. The evidence would be the participants linked post, the badge would link to that as evidence and assert that it was up to scratch. While I fully agree with your criticism of the Open Badges you have analysed, I simultaneously fully disagree with your perspective on Open Badges. Open Badges could be powerful instruments to grow “informal recognition of informal learning,” unfortunately it is almost solely used to enforce “formal recognition of informal learning” and more and more “formal recognition of formal learning.” Open Badges are now used by institutions of formal education, not to reform themselves, but to invade and take over the informal world with the paraphernalia of standards, awards and rewards attached. Thanks to Dan Hickey for pointing my attention to this conversation. Finally the conversation about badges has generally moved to this crucial issue. Both of your example badges are from Credly. Then in 2015 I did two more ELI FTF presentations and was quite unhappy with the badges I earned. When I clicked on the evidence link they went back to the EDUCAUSE home page and a search link. Out of curiosity I entered my name and it said “nothing found” The dreaded “anti-evidence.” So of course I did not share it. But I did email Sondra and Jonathan Finkelstein to try to get to the bottom of it. The threee of us ended up on a conference call that was really helpful. Turned out that there were two factors. The first is that my first presentation was virtual so it was natural for EDUCAUSE to have posted a landing page with my slides and was just a bit more work to post the video. The second factor was the constraints of the EDUCAUSE’s Drupal-based website that create a substantial manual lift to extract all of the urls for presentations and then upload them to Credly for inclusion in the badge. EDUCAUSE is currently rebuilding their website and I understand that they are going to address this problem in due time. 1. They are different than conventional credentials because they (a) can contain specific claims, (b) can include detailed evidence supporting those claims, (c) can include links to more claims such as completed work, (d) can circulate this information freely in digital networks, (e) can accrue additional endorsements as they circulate. 2. Badge systems that are not designed to exploit these features may not be worth the trouble. Most of the 29 projects we studied in the Design Principles Documentation project (http://dpdproject.info/) that only used badges as digital mini-certificates with no evidence never got past the pilot stage. The few badge systems that are still thriving (like MOUSE, PBS New Hour Student Reporting Labs, and Supporter to Reporter Medals) all exploited the unique features of digital badges. 3. A crucial question in any badge system design is what evidence to include and how to get that evidence in the badges. Credly filled a massive void in 2013-2014 where people needed to get badge systems up and running quickly. My hats off to Jonathan and his colleagues for doing so. But there is a LOT of additional work that needs to be done to allow organizations to deliver a csv file for issuing badges that includes evidence urls that contain information that is credible evidence of the claims in the badge. 4. Many of the early adopters of open badges were Naturally proponents of gamification and very traditional mastery-based and competency-based education. Rooted in relatively conventional associationist models of learning, these examples naturally offended constructionists like Mitch Resnick (https://www.hastac.org/blogs/mres/2012/02/27/still-badge-skeptic) and self-determination proponents like Alphie Kohn (https://www.youtube.com/watch?v=p_98XcxJqkw). These “rationalist” perspectives are antithetical to the associationist perspectives behind gamification and CBE. 5. More importantly, the early proponents did not embrace the sociocultural perspectives found in the work of John Seely Brown, Mimi Itow that were at the core of MacArthur’s DML initiative. Connie Yowell’s dissertation was a brilliant reframing of self-regulation from these perspective (http://www.jstor.org/stable/1002300?seq=1#page_scan_tab_contents). These perspectives directly shaped the entire open badges movement. Already, bordering on TLDR. But my hats off to Alan for getting this conversation started. I actually found this post because Nate Otto has invited Alan to join one of the Badge Alliance community call on March 9. This reply is intended to encourage him to join and to help move the conversation forward. I’m in for the conversation, Dan, and thanks for a lot of info for me to peruse look at. And there is no such thing as Too Long a comment around here. I am smiling at the term “carpet-badging” yet I do not want to be so flip to ignore the entire scope of work being done. What I am weighing is, how do we get to a point where a collection of badges have value as to what now more or less seems like “it feels like it has value”. And i can see that maybe for people new to the idea and also new to building their professional profiles, some simple to achieve badges makes sense. PS- I’m a long time colleague/friend of Jonathan back to the start of LearningTimes. Hey Alan, can you confirm that you will be joining the Badge Alliance Community Call this Wed March 9 at 12pm ET? I’d love to catch it, and am trying to negotiate a scheduling conflict. I think another issue we need to bring up are the number of badges connected to evidence that simply points to a 404. Badges are built on a backbone of link rot. This scares me somewhat. I want to empower learners to own, shape, and then share their evidence into badging platforms rather than have the platforms work similar to other silos. A domains of one’s own may not fix link rot. It might actually increase as students decide not to keep hosting their own domains once they move on but atleast it would be their choice. I have long carried the rallying cry “a badge with no evidence has no meaning!” Although I realize that statement is not strictly true, I still stand behind it as a guiding principle for the use of open badges. To avoid “carpet-badging” or (#carpetbadging) we need to make sure that badge earners actually post SOME KIND OF EVIDENCE in order to earn badges. This requires two things. 1.) Badge issuing platforms must be built to effectively list and display evidence to earn a badge (see Dan’s above comment about Credly) and 2.) Organizations that issue badges need to create badges that require robust evidence. When this happens, even badges issued at conferences can be real, meaningful credentials that are valuable to both the earner and the issuing organization. I have been quite impressed with the badges issued at the recent ICE conference. Although there is a badge awarded to “attendees” of the conference, those who earn this badge must post a photo and “briefly describe their learning goals” to earn the badge. Far from carpet-badging, this requirement allows attendees to make explicit learning goals that they can check at the end of the conference or even years down the line. It also helps the ICE conference organizers get a picture of what their attendees are interested in. This array of learning goals submitted as badge evidence puts a smile on my face. Badges at the ICE conference go deeper than this too, asking teachers to write reflections about new things they learned at the conference. When real, robust evidence is required, even conference badges come to have meaning. I think a lot of the current problems around evidence and meaning in badges is the lack of a good example such as that provided by the ICE conference badges. We learn what we are taught, and when teachers are taught by carbetbadging conference organizers that a badge is just a little image that you don’t do anything with, you get exactly what you’d expect. Teachers who have been taught that they need to provide learning evidence to earn badges also require this of their own students, and I have seen this over and over again in Badge List. CUE conference attendees have similarly been required to post meaningful evidence, and the badges they create for their own students are consistently of high quality. As one final note, I’d like to add that a lot of great learning evidence hosted on Badge List is private student data and thus cannot be shared. Teachers are learning how to do make great badges, but student data laws actually prohibit them from allowing their students to share their learning evidence. This is one big contradiction for badges in the K12 context. Badges are supposed to be publicly viewable credentials, but no student data is allowed to be publicly viewed. I’d be interested to hear if anyone has further thoughts on how to handle this. Thanks for sharing Badge List, Ben, I’m diving in to take a closer look. It definitely provides more points to collect evidence / reflections from conference events. What does it take for people to add this info? The thing with evidence collection is that it will become a chore unless the person sees direct value in doing it. And I do have concerns about where all stuff lives. What happens if Badgelist vanishes? So much of this activity is “out there” and I prefer to manage my own evidence (I might submit URLs that point to my own hosted content). Its my pleasure Alan. Thanks for taking the time to check it out. Adding evidence in Badge List is very straightforward. Once a learner has joined a badge, they just have to click the “post evidence” button and link to their evidence or write their response in the text box provided. At the upcoming CUE conference, there will be rewards for people if they manage to collect 5 of the 6 badges available. The evidence associated with the badge is also a value in itself. Those who have earned badges year after year can come and remind themselves of their progress as their expertise increases. In response to your last point, I heartily agree. I would rather see a link to learning evidence hosted on a learner’s portfolio than evidence hosted only within Badge List. Indeed, this is often how our users choose to work with BL. The idea that the learning portfolio is its own entity separate from credentials is something we are building in to Badge List with upcoming feature sets. To respond to your specific concern about Badge List disappearing; in this event we would make all badges and evidence exportable by learners. Ultimately we would like to have Badge List integrate with LMSs and ePortfolio softwares as well as having our own native ePortfolio system for our learners to use. Thanks Monika, if you have some specific references please share. I’ve only waded through Taleb’s Black Swan (partly). I still find Twitter lists valuable as a type of organic tagging of people’s interests and expertise, and I still think LinkedIn endorsements from people in my professional network is LESS accurate than the Twitter tags people assign to me, and I’m not sure if Klout is even still relevant (and I won’t be logging in to check). I haven’t had enough coffee yet this morning to explore the thought further, but I wanted to toss the “reputation economy” discussion into the ring, too. Thanks for this, Chris… I’m thinking on this idea, and curious too about the Twitter list approach. My first thought is that these are perhaps possible indicators of reputation value, rather than measures, like maybe a wiggling compass needle. And also, our acceptance/evaluation of such things are measured against how much the support our own internal perspective.